"The Japan that the Kushinada must protect has disappeared. Why don't you listen carefully? You can hear it. Japan is crying." I feel the need, the need for Seed. Greetings sports fans, we're back with another look at the continuing Blue Seed Saga. After fourteen episodes on the previous two discs in the series, we are down to the remaining twelve episodes, which will span this and the final disc in the set. While we looked at the main characters Momiji and Kasanagi in our last review, this time we'll talk a bit about the members of our TAC team, who continue to do battle with the Aragami threat cursing Japan. First is our team leader, Daitetsu Kunikida (Virgo, blood type B), who lost his adopted daughter Kaede at the beginning of the series. Through the course of the six episodes on disc three, we will come to understand a bit more about his background, especially when he visits an old friend in episode 16. Daitetsu has now taken Momiji under his care, and despite his sense of humor (or lack thereof—he thinks he's funny), he is really a nice guy. In fact, so nice that Ryoko Takeuchi (Leo, blood type AB) has taken an interest in him, despite being much younger than him. Ryoko is quiet, though she is an expert marksman, er, person, more so than her brash companion, orange-haired Kome Sawaguchi (Aries, blood type B), whose motto is "If you still have bullets, keep firing." She gets along with Momiji now, though at first thought she was a spoiled brat. If you want to stay in her good books, keep your hands off her guns. Not one for overkill, a bazooka is about minimum for Aragami hunting. As the resident computer geek, Yoshiki Yaegashi (Pisces, blood type O) is always looking for new ways to defeat the Aragami, which include coming up with some interesting software for predicting which animal would be on Momiji's underpants—well, it was to test his theory, really. Yoshiki has quite an interest in Momiji actually, which we will see during this series of episodes. Finally we have the team scientist, Azusa Matsudaira (Capricorn, blood type A). She is constantly developing new weapons for fighting the Aragami, based on their plant-like origins. She is most proud of her son Jun. We continue to do battle with the Aragami threat, but the price is getting higher. With Murakumo's involvement increasing, Kusanagi has to determine just whose side he is on. As the TAC team continues its investigations, an unexpected element has been thrown into the equation, which causes many members to re-think their purpose in this endeavor. With the stakes rising, will they have the strength to overcome the Aragami and preserve Japan? I found this series highly involving, and was aching for more when the final episode on this disc was over. The story is getting more complex, and the interpersonal relationships are adding a nice added dimension. Unlike some series that tend to focus on one or two characters, there is good exposition of everyone involved, and there doesn't seem to be too many superfluous characters. Newcomer Sakura looks to be getting ready to play an increasing role in the story, and the mysterious origins of the Aragami continue to be exposed in a slow, methodical fashion, leaving the viewer looking for more. Once again we have a high episode count, with six on this disc, and fortunately, this isn't degrading the video presentation. With only one disc left in the set, I have a feeling I'll be clamoring for more Blue Seed pretty soon, and hopefully we'll be seeing the OVAs show up in the not too distant future. Image Transfer Review: Once again we get a great looking disc with only minor sticking points. Colors remain vibrant, with good contrast and solid black levels. A bit of graininess and some artifacting in the dark blues or neutral beiges, and normal interlacing artifacts are present. This still looks great, despite the episode count. Audio Transfer Review: Audio presentation continues to impress. While this isn't an effects showcase, directionality is used tastefully, and I continue to enjoy the expressiveness of the Japanese voice actors. Music is well used throughout, and everything is well-balanced. During a few episodes, there is a static crackling on the Japanese audio track, some of the time. An English dub is also available, though I'd prefer the Spanish track over it anyday. Extras Review: Omake! Omake! Omake! Omake! Better add one more, as we get a total of five Omake Theaters on this disc. These are short, animated segments featuring characters from the show in some weird and wacky situations, and are a great bit of fun I wish were found in more anime series. In On a Rainy Day, Momiji lies around her room, daydreaming of Kusanagi; sentimental and sweet. Omake Theater 6 has Kusanagi finally fighting on even terms, as he challenges Murakumo to a game of Jong Jong Mahjong. Poor Aragami... Next, it's Festival Night and Kome is embarrassed when she discovers a poem she wrote in third grade about her first crush, which brings back a flood of memories. The English dub has some pretty significant variances from the Japanese script. What a way to start your day, with Omake Theater number 8, Kunikida... Ker-woosh! !, a nice breakfast and a hot bath is all a man asks for, can this please go off without a hitch? Thought not. Finally, it's The Day of Shugishita, and while the girl of his desires may be longing for someone else, all is not lost. Be sure to switch to subtitle track two for the English song lyrics. Another installment of the Blue Seed Saga overview, and character bios for Kome, Yoshiki and Murakumo comes spoiler-free. Six preview trailers round out the extras: Sorcerer Hunters, Samurai X, Sorcerer On The Rocks, Gunsmith Cats, Original Dirty Pairand Gasaraki. Six more episodes in the series add more depth to the characters and deepen the plot with further revelations about the Kushinada. The involvement with the cast is adding a lot to my enjoyment, as stories flow on many levels, and Momiji is as funny as ever. 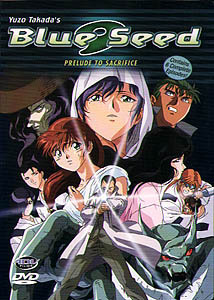 I'm not sure why Blue Seed doesn't seem to have as avid a following as some other anime, as I am thoroughly drawn in and anxiously awaiting the final arc of the story. Add in the omake theaters, and this is a must buy.